The Student Cluster Competition returned for its 10th year. The competition which debuted at SC07 in Reno and has since been replicated in Europe, Asia and Africa, is a real-time, non-stop, 48-hour challenge in which teams of six undergraduates assemble a small cluster at SC16 and race to complete a real-world workload across a series of scientific applications, demonstrate knowledge of system architecture and application performance, and impress HPC industry judges. The students partner with vendors to design and build a cutting-edge cluster from commercially available components, not to exceed a 3120-watt power limit and work with application experts to tune and run the competition codes. 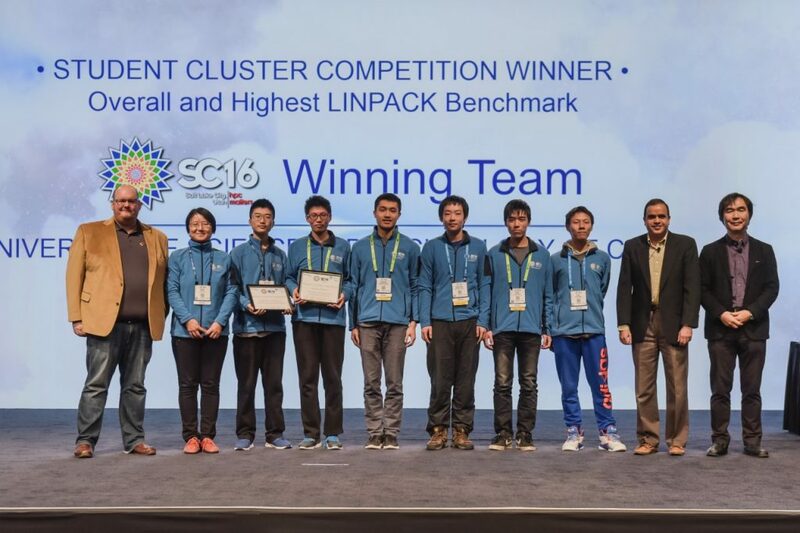 For the first-time ever, the team that won top honors also won the award for achieving highest performance for the Linpack benchmark. The team “SwanGeese” is from the University of Science and Technology of China. In traditional Chinese culture, the rare Swan Goose stands for teamwork, perseverance and bravery. This is the university’s third appearance in the competition.